2nd of October is celebrated every year in the country as Gandhi Jayanti to commemorate the birthday of the ‘Father of the Nation’ Mohandas Karamchand Gandhi. This day is celebrated as the International Day of Non-Violence as Gandhiji was the preacher of non-violence. He is a symbol of peace and truth. 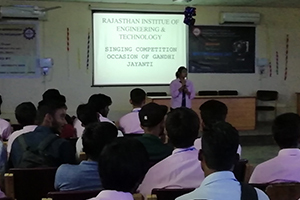 This day was celebrated by the students and faculty members of RIET (Rajasthan Institute of Engineering and technology) and on this occasion, the students participated in various events organized for them. 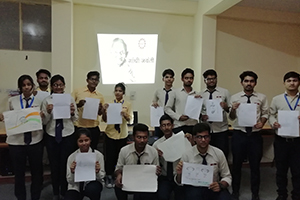 In the department of CSE/IT– A Debate competition was organized and the topic for the debate was (Role of Gandhi in India’s freedom struggle is exaggerated). A large number of students participated in this event. The judges were the faculty members of CSE/IT. In the department of ECE– the event was “talk on Gandhi jayanti”, various speakers participated in the same. The talk was conducted on this day with great enthusiasm to pay tribute to the Father of the Nation as well as remember his courageous deeds on the way of independence struggle for the country from British rule. Various aspects of his life were discussed, his childhood, simple lifestyle but high thinking. He was the pioneer of truth and non-violence who started the Satyagraha movement for India’s freedom. He struggled a lot and played a significant role in the achievement of freedom for India from British rule. He not only pioneered the unique method of non-violence to get freedom for India against British rule but also proved the world that freedom can be achieved peacefully through the path of non-violence. He is still remembered among us as the symbol of peace and truth. The talk was ended by singing his favorite song “Raghupati Raghav Raja Ram, Patit Pavan Sita Ram…”in order to pay homage to Gandhiji. The students showed great enthusiasm in the debate and put in their wholehearted participation in the same. 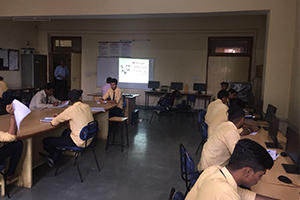 In the department of EE/EEE Painting competition for students of IInd & IIIrd Year students was organized by the department of Electrical and Electronics Engineering. Painting Topic was based on Gandhi Jayanti. This competition motivated them to express their view and explore their creativity through their art works. All students are participated with full enthusiasm. In the department of ME-essay writing was organized on this day. Students very highly enthusiastic for this event and all the students participated fully. 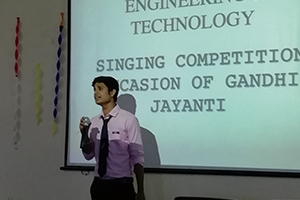 In 1st year– a singing competition was organized of (Patriotic songs). This event showcased the talent of all the singers in 1st year, who sang beautiful heart touching patriotic songs to commemorate the occasion. Principal RIET Dr Saroj Hiranwal encouraged and congratulated the winners in various competitions; she also conveyed the message to follow the path of harmony and peace as preached by Mahatma Gandhi. She said that people take this day to remember a man who is responsive in a huge way for the lives they are leading today. They try to remind themselves of the importance of kindness, truth, non-violence, resilience, simplicity and peace – all the things Mahatma Gandhi stood for. 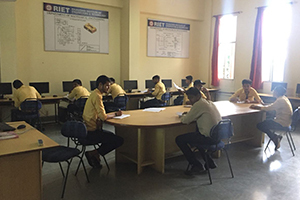 Dean Academics & Administration, Prof. Kapil Dev Sharma said that these activities are very essential in developing communication skills, language skills & confidence, therefore very essential for technical students. Dr Sachin Sharma, Vice Principal RIET upheld the values of Gandhiji and highlighted the sacrifice he made for the country. The event ended with a patriotic feeling in the hearts of all students and staff.